No one will leave this party empty handed as we will be making our own (additive free!) sherbet to take home. We will also be finding out what puts the fizz into our fizzy drinks and making some of our own. Next we will make candy floss and everyone will have a taste of course! We will also be looking at the science of colours when we make rainbows appear before our very eyes! As with all parties children will be given their very own certificate to take home written out to their brand new science name. This party lasts for around 45 minutes and is recommended for children aged 4-11. The price quoted is for 20 children but extra children can be added at just £2.50 each. 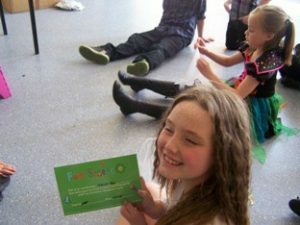 “Smashing kid’s party thanks to Fun Science – highly recommended” – A comment from a parent who booked a Sweets and Surprises party for her daughter’s 8th birthday party near Bristol. Got an enquiry or want to find out more? Email dorset@fun-science.org.uk or call 07468 574178. Not based in Dorset? Click here to find your nearest branch. Looking for something more electrifying? Click here for more party packages.